The Holy Quran and We ~ Islam My Ultimate Decision . The Holy Qur'an is the fountainhead of Divine guidance for every Muslim. This is a Divine Holy Scripture that was revealed unto Prophet Muhammad ( ) by Allah Almighty through His most trusted angel Jibraeel (Gabriel) over a time period of 23 years. The Holy Qur'an contains commandments and guidelines for the Muslims to lead a life as wanted by our Creator, Allah the Almighty. However, this is most unfortunate that this Holy Book of Guidance which was revealed for us to READ, for the word Qur'an literally means "the recitation" in Arabic, has been left out of our daily lives, duly wrapped in the upper most shelves of our cupboards. 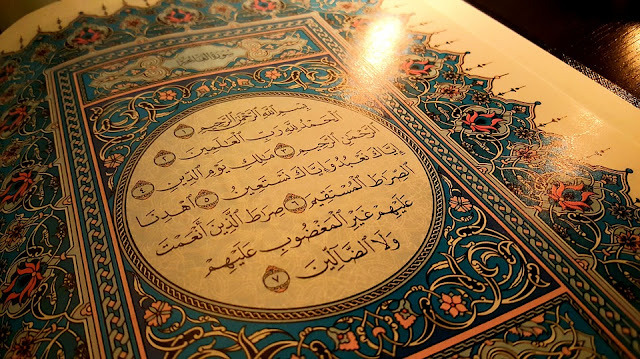 The chaos we witness in the Muslim world today is that we have stopped seeking guidance from Holy Qur'an and depend more on books written by humans to lead our lives. A lot many of us are fond of reading books like so many facets of successful men, how to become rich, how to become famous, or how to become a thriving entrepreneur and like but fail to realize that many such attributes and traits of successful men are given in the Holy Qur'an, but we never ventured to read, understand and implement the Divine guidance contained in the Holy Qur'an. In fact there is a difference of perception of a successful man in our ordinary lives and in a life prescribed by us in the Holy Qur'an. When we pursue worldly goals, it gives us success in a limited sense. One who attains the heights of of one's professional life can boast of being a successful man or businessman, but that doesn’t necessarily mean that he is successful in life. But these short lived wordily gains do not help us to gain the best of both worlds. what we have today here, our wealth, our high ranks of offices and business community will be of no use when death begets us. Because from then on a life of different kind a a nature would start.